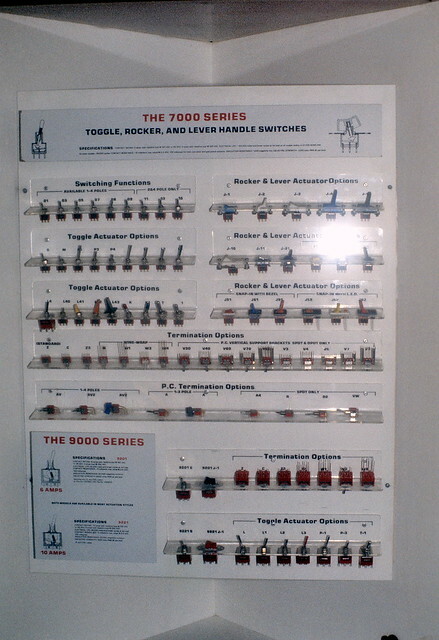 The old 7101 display board | Flickr - Photo Sharing! Anyone who worked a C&K booth at an electronics trade show is familiar with this display. p.s. I found a couple hundred 35-mm slides in my basement recently. They were stained an in poor condition. I sent them out to www.scancafe.com. They sent them to their operation in India. They cleaned the slides, then digitized them, and sent me a CD with the images back to me. I remember organizing hundreds catalog/brochure mailings from various mfrs for my employer back in 1976 and seeing the C&K switch catalog. As an engineer wanabe, I recall reading every page of every brochure while I put them in filing cabinets. It took weeks for what my employer said should have taken a day or two. Thank you C&K for your part in my selecting electrical engineering as my career.